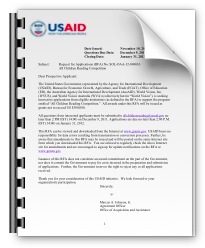 The United States Agency for International Development (USAID), the Australian Agency for International Development (AusAID), and World Vision (collectively referred to as the “Founding Partners”) are seeking game-changing innovations with the potential to dramatically improve reading skills and low literacy rates among primary grade children. Through a multi-year initiative called All Children Reading: A Grand Challenge for Development (ACR), the Founding Partners will collaborate to achieve the goal of global action to improve child literacy. While recognizing that there are many factors required to improve student learning outcomes in primary grade reading, the Founding Partners have established the All Children Reading Competition to focus on two needs that are both important and largely unmet in low- and lower- middle income countries: teaching and learning materials and education data. The All Children Reading Competition will support innovative approaches that draw on current research findings related to effective instruction in primary grade reading as well as technology, information, and communication advances that may lead to substantial impact on student learning outcomes at scale. In this context, “innovation” refers to novel business or organizational models, operational or production processes, or products or services that lead to substantial and sustainable improvements in student reading in primary grades. We seek innovations that produce development outcomes more effectively, cost efficiently, and that reach more beneficiaries. Innovative and potentially transformative solutions may be funded through grants to support new ideas as well as emergent practices, products, or programs. The Founding Partners are calling on for-profit companies, non-governmental organizations and associations, academic/educational research institutions, faith-based organizations, civil society and foundations—together or in partnership—to take up this challenge. Applicants are encouraged to “think outside of the box,” using creative practices and methodologies to develop innovations clearly linked to improving student learning outcomes in primary grade reading. Over the past decade, governments in many countries and the international community have rallied around Millennium Development Goal 2: ensure that, by 2015, children everywhere, boys and girls alike, will be able to complete a full course of primary schooling.2 As a result, there have been significant increases in primary enrollment worldwide, particularly in low income countries.3 However, learning levels are very low. In Mali, Pakistan and Peru, for example, more than 70% of children in the primary grades could not read at grade level and many could not read a single word after two or more years of schooling.4 One major international assessment, the Progress in International Reading Literacy Study (PIRLS), found that the average student in low-income countries is performing at the fifth percentile of the OECD distribution worldwide an estimated 35 million girls remain out of school compared to 31 million boys. USAID has been working to close the gap between boys and girls by assessing the degree of educational disadvantage that girls face, identifying gender-related obstacles, and implementing remedies to remove and overcome these obstacles. Learning levels of a country’s population are directly correlated with rates of economic growth. A 10% increase in the proportion of the population with basic literacy skills translates into a 0.3 percentage point higher annual growth rate for that country. Other research has shown that early grade reading competency is critical for continued retention and success in future grades. Though it is clear that children’s futures are not solely dependent on reading instruction, reading is a critical and necessary precondition for skill development. Children who do not develop reading skills during the primary grades are on a lifetime trajectory of limited educational progress and therefore limited economic opportunities. In recognition of the importance of basic literacy for individual and national development, the first goal of the new USAID Education Strategy: Opportunity Through Learning (2011-2015) is focused on improving the reading skills for 100 million children in primary grades by 2015 (See Appendix 1). USAID will measure the performance of its programs primarily through the improvement of reading skills for primary grade students after two years of schooling, consistent with international measures adopted by the Global Partnership for Education (GPE, formerly the Education for All-Fast Track Initiative). The new Education Strategy also specifically states that USAID education programs will take measures to increase gender parity and improve gender equity at all levels of education, with gender-sensitive interventions tailored to the specific gender issues present in a country’s educational system. The importance of this for gender equality extends beyond any single project in that it sets a clear strategic directive: USAID education interventions that target girls or boys should be based on sound gender analysis, meet an identified need or demand, promote learning outcomes, bring about systemic change, and work to transform the power dynamics between the sexes. World Vision invests more than US $250 million per year in education and focuses on impact for children and youth ages 3-18 through four strategic objectives that foster the development of functional literacy, math and essential life skills as key outcomes of education: 1) increase children’s access to equitable, quality and sustainable early childhood education and primary education, with special attention to the most vulnerable groups; 2) strengthen community involvement in the education for all children; 3) increase youth’s access to quality educational opportunities, with focus on out-of-school youth; and 4) foster enabling environment for learning through partnership and advocacy with communities, governments, private sector, universities, donors and civil society organizations. driving development through better governance and service delivery so that partner governments support quality education for all. The All Children Reading Competition will encourage innovative thinking and design to bring new knowledge to the challenge of improving primary grade reading rapidly and at scale in certain countries (see Appendix 2 for a list of Eligible Countries). Applications from and relating to low- and lower-middle income countries are particularly encouraged. While recognizing that there are many factors required to improve student learning outcomes in primary grade reading, the All Children Reading Competition seeks innovations in two areas that are both important and largely unmet in certain low- and lower middle income countries. Teachers and children must have access to appropriate teaching and learning materials, respectively, for classroom instruction and reading practice. Children who report having textbooks score higher on reading tests and those who report having other books at home score even higher.8 Recently developed programs supporting the development of materials to schools, communities and homes are beginning to report impact on student learning.9 However, textbook provision in developing countries continues to be inadequate, let alone provision of supplemental reading materials. Innovative and affordable approaches are needed to overcome barriers to the design, production, distribution/delivery, and use of high-quality durable and consumable materials (narrative, expository, and instructional) in appropriate languages for the primary grades in developing countries. Education data is necessary to support decision-making, incentives, transparency, and accountability needed to improve reading. A lack of quality data on student learning and related issues (e.g., teaching methods, student and teacher performance, absenteeism, and school-level financing) hinders the development and implementation of effective educational policies and supportive classroom/school-level/community action. The potential impact of data on student learning has been very visible over the past few years, with the development of Pratham’s Annual Status of Education Report (ASER) approach to data collection by civil society, now used in India, Kenya, Mali, Pakistan, Uganda and Tanzania as well as USAID-supported Early Grade Reading Assessment (EGRA) which has now been used by governments, civil society and donors in more than 40 countries. These assessments have created widespread awareness of student learning levels and some efforts to improve learning in the countries where they have been implemented. But much remains to be done to prioritize and collect performance data, disseminate the data to varied audiences and make it easier to identify and use key data for decision-making. Innovative and affordable approaches are needed to improve efficiency and effectiveness in the collection and use of education data. A particular need is cost-effective and streamlined approaches for the measurement and reporting of student learning data (classroom-based and system-level testing) to inform instruction, policy development, and resource allocations in developing countries. We are interested in funding innovations that will result in (1) widespread access to improved teaching and learning materials and (2) better education data to support decision-making, transparency, incentives and accountability; both of which are essential to advance the goal of All Children Reading in the primary grades. In this context, “innovation” refers to novel business or organizational models, operational or production processes, or products or services that lead to substantial and sustainable improvements in student reading in primary grades. The illustrative areas of interest listed below are not meant to be exhaustive or limiting in any way. Create differentiated learning experiences and support individual student practice in low-resource classroom settings with high student : teacher ratios. Provide data to support the development of appropriate incentive systems for teachers and officials based on teacher performance and student results. Solutions that are not applicable, affordable, sustainable, and scalable in eligible countries. Written by Wayan Vota on January 10, 2012 in Education Management Information Systems. We would be pleased to have detailed information about sponsorship opportunities for the initiative “Innovations in Education Data”. Our company, JP Sá Couto, is dedicated to the design, development and distribution of Technological Solutions, and leader of a global reference initiative pioneering ICT-based Education. We are the largest OEM to deploy Intel Classmate-based educational netbooks, operating in more than 60 countries. JP Sá Couto developed MGseries family of products to give students and teachers the best tools to be productive in an educational environment. And we have delivered over 3 million MG series classmate netbooks around the world. we want to work for marginalize community,with your support.How it is possible? It is very heartning that the focus is on disadvantaged groups and more important that language learning is highlighted. Poor language competency affects the quality of all other subjects resulting in dropping out.. This leads to wastage in education which the developing countries can ill afford. At the moment the Association for Education Development and Research Sri Lanka (AEDRSL), of which I am the Chief Research Coordinator, has launched a project on the quality development of teachers serving rural disadvantaged and marginalised schools namely Small Schools. Under this project few selected teachers are assigned to undertake school based research. We could focus on language teaching as one of the themes in this research. Proposal for the above could be shared with you as well.